11. Preheat oven to 350° F. Coat a 9 x 13-inch baking dish with cooking spray. 22. In a large skillet, heat 2 tablespoons of Zoye Low Saturated Fat Premium Vegetable Oil Premium Vegetable Oil over medium-high heat. Add onions and peppers, and sauté 10 to 12 minutes, or until onions are lightly browned; place in a large bowl and set aside. 33. Heat remaining 1 tablespoon of Zoye Low Saturated Fat Premium Vegetable Oil Premium Vegetable Oil in the same skillet and add flank steak. Add fajita seasoning and sauté 3 to 4 minutes. Return vegetables to skillet and cook 3 to 4 more minutes, stirring occasionally. 44. Place ⅓ cup of the flank steak mixture into each tortilla and roll up; place roll-ups seam-side down in prepared baking dish. Sprinkle with cheese, then cover with aluminum foil. 55. Bake 15 to 20 minutes, or until heated through. 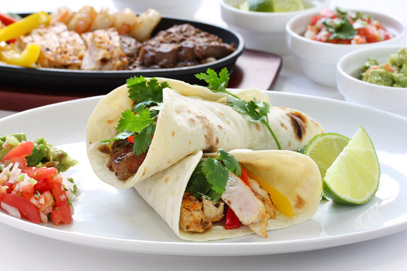 Serve fajitas with sour cream and salsa.